A lovely one bedroom suite. The Xanadu Treehouse is a 'tiny' house, set in the trees. 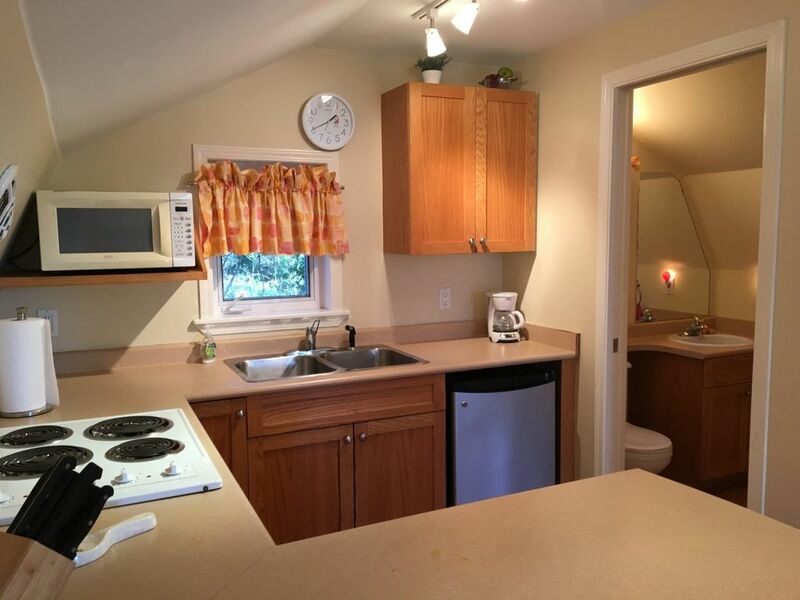 It has a compact fully equipped kitchen, and cute bathroom with a deep soaker tub and shower. The Treehouse has a comfortable queen sized bed, and comes with spa quality linens and bedding. You will be cozy and comfortable. This suite is wonderful for one or two people. Your kitchen has tea and coffee making facilities, microwave, stove, and quality dishes and utensils. Everything is there for you. Even the salt and pepper! You have a lovely deck to relax on that overlooks the green fields and hills of the Cowichan Valley. You have free high speed wireless internet, a washer and dryer, and all guests receive a complementary bottle of Xanadu Estate wine. Xanadu Estate has an outdoor fireplace, expansive lawn and gardens, free bike rentals, and a barbeque area for your use. Larger parties often stay in both locations. "Cowichan" means the Warmlands. We have the highest overall average temperatures in Canada. Come and escape winter and enjoy. Or come and enjoy the magic of all the seasons. One of the top culinary destinations in Canada, the Cowichan Valley is home to award winning wineries, organic farms and innovative artisan food-producers who have created a thriving central Island agritourism industry based on fresh, local, seasonal and sustainable food. There are many close by gourmet restaurants, delis, and farm markets. Along with over a dozen top wineries, a cidery, a distillery and a brew pub, everything from tea to kiwis, pasture-raised meat, to French lavender is cultivated here. Well-maintained country roads meander throughout the region. Cowichan's pretty towns and villages, including Chemainus, Mill Bay, Ladysmith, Duncan, Cobble Hill and Cowichan Bay offer everything from art galleries, outdoor murals and antique malls to country fairs, fishing piers and farmers markets. The Treehouse is very comfortable for one or two persons only. There are many hiking trails and parks close by also to the Treehouse. There is a close by doggie park and pets are always welcome at Xanadu. Ten minutes away is Cowichan Bay where there are lots of funky shops, outdoor markets and whale watching. Fishing is available in Cowichan Bay off the pier, or you can rent a boat. Come and play at Arbutus Ridge Golf course which is three minutes up the road. Arbutus Ridge Indoor tennis dome, dining room, and driving range are all there. The beautiful, clean Shawnigan Lake is close by for swimming, and the ocean is within walking distance. The Cowichan Valley is a unique and beautiful part of Canada. Come and enjoy Paradise! The average winter temperature is 6 to 8 degrees C, the days are mild and you can be outside every day. Come and escape the winter at Xanadu Treehouse. Or, come any season and enjoy the beauty of the Cowichan Valley. Our house rules: no smoking, no parties or events, pets permitted. No smoking inside. There is a designated smoking location on the property. The rate is based on double occupancy or parents with up to three children below 19 years staying with them. Additional guests are only $25.00 per night. First night deposit is required. The Treehouse is very comfortable for one or two persons only. For accommodation for additional persons or larger parties, please look at the Xanadu Estate listing, and contact Jane on 250 532 2100. Come and enjoy Paradise!